The U.S. economy is steadily expanding but for many workers, paychecks barely keep ahead of inflation. During these financially challenging times, smart moms and dads carefully monitor household spending. A birthday party needn’t be an extravagant affair. You can create a fun and fabulous event for your child at a reasonable cost. Here are a few tips from playparty.net. 1. Sharpen your pencil; be realistic. Figure out how much you can afford to spend on the party. Then, stick to your budget. 2. Use your home or another low-cost location as the party venue. For example, the neighborhood park is free and offers plenty of space for the kids to play. 4. Before selecting a time for the party, think about the type of refreshments you’ll serve. Does your budget permit you to provide a meal? Or are snacks a better fit? Meals are appropriate for parties held between 11 AM and 1 PM or between 4 PM and 6 PM. If the party is scheduled for mid-morning or mid-afternoon, snacks may be sufficient and acceptable. 5. Send invitations electronically if you have email addresses for all of your guests or their parents. (Hint: Check out paperlesspost.com, evite.com and punchbowl.com.) Not only will you save on postage and stationery, but on-line services make it easy to track RSVP’s and send reminders. 7. Purchase food, such as crackers, pretzels or fresh fruit and vegetables, in bulk. 8. Serve beverages, such as juice or soda, from large bottles instead of purchasing individual-sized containers. 9. If possible, use items that you already have at home as part of the decorations. 10. 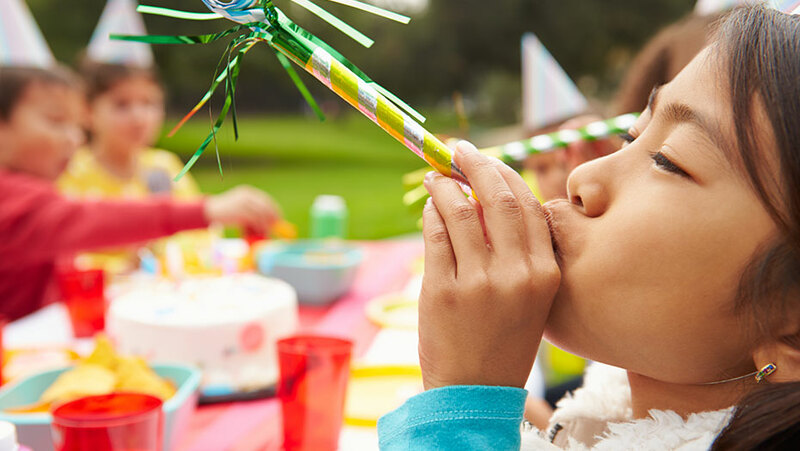 Buy decorations and other party supplies from a discount store. 11. Prizes and party favors are optional. If you choose to provide them, keep in mind that they needn’t be elaborate or expensive. 12. Use paper bags to hold party favors. During the party, have guests decorate the bags. 13. If your child wants to celebrate his/her birthday at an amusement park, allow him/her to invite just one special friend. 14. Remember what’s most important about marking your child’s birthday — honoring his special place in the family, and reminding her how much she is loved. Savor the sweetness of the day. Contact us for more birthday party tips and to book the Best LEGO Party or the Ultimate Race Car Party .